Natural Healing with Sound and Vibration « Allentown Hypnosis – Hypnosis for Positive Results! Substances and sounds are energy that vibrates at different speeds. We sense those vibrations not only by our five physical scenes but also through our intuition. If you were to walk into an empty room where there was great sadness or anger you would feel it as heavy, dense and draining. The vibration of that room would be slow and if you stayed in this room it would pull your vibration down. If you were to walk into a room where there is great happiness, joy and laughter you would feel that as light, airy and uplifting. The room would be vibrating high and if you were feeling a little sad it would increase your vibration and you’d feel better. When we are out of balance physically, mentally, emotionally or spiritually there is blocked or heavy energy that we hold within us and around us. Sound can be used to break that block or heaviness. What’s the first thing we give to a crying baby, a rattle? Why? It soothes them. It creates a noise to calm them while helping them to let go of the emotion. Why, because it breaks up the heavy energy that the baby is feeling creating lightness for it. Many cultures have used tools to increase vibration since the beginning of time to create music and to aid healing: gongs and Tibetan bowls, didgeridoos, chimes, flute, rattles and drums. Anything that makes sound can be used to increase vibration. The tools I use the most for myself and clients are the drum, rattle, my hands and my voice. I ask my higher self which would be of greatest benefit at that moment. If I hear my hands then I will clap or snap at different parts of the body following my intuition. If I hear use my voice, I will tone “ah” for the heart and “me” for the solar plexus. I allow myself to be guided when using the drum or rattle around the body as well. 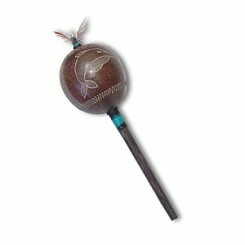 I have a beautiful rattle that was hand carved by an Andean Shaman but you can use any kind of rattle as long as it feels good to you. You can even make one yourself, there’s no need to run out and buy tools. Use what’s around you. A dried gourd, paper can from breadcrumbs or the cardboard roll from paper towels and some beans would work. Seal up the ends. Play, move your rattle fast and slow, tap it on you, shake it and you’ll find your rhythm. Make designs on the outside and invest your energy into it. Shake at different parts of your body and notice how it feels before and after. You can even take two small branches and bang them together around your body. Listen to your higher-self and do what feels right for you. It is beneficial to rattle, clap, drum, etc. above your head and move down to your eyes, throat, heart, solar plexus, an inch below your navel and your bottom (all the chakras). Close your eyes and spend about five minutes or more on each position. Don’t forget to shake, rattle or drum behind your body, it’s just as important. If you want to tone, with your eyes closed take a deep breath and tone the “ah” for a long exhale. Continue to tone “ah” for five to ten minutes then tone something else like “me” or “ohm” when finished with all the tones you want to do sit still with your eyes still closed and allow yourself to feel your body vibrating and notice the shifts you have made. It is very common while toning that your voice changes pitch and/or cracks. Just stay with it. It’s breaking up heavy energy, raising your vibration and when you are finished you’ll feel lighter.